Dave Fox is a certified life coach based in Vietnam. 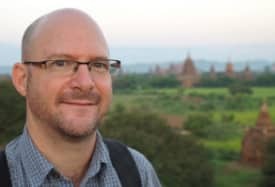 He works with clients all over the world via Skype, FaceTime, and phone, and is also available for in-person life coaching in Ho Chi Minh City. Self-confidence and how to challenge self-doubt. Creativity, creative success, and challenges of the creative mind. Time management challenges and techniques (with a focus on solo entrepreneurs and people pursuing creative projects). Distraction management and adult ADHD. Culture shock and its effects on personal relationships for people living overseas. Cognitive Behavioral Techniques – the stories we tell ourselves about our lives, how those stories affect our emotions, and how exploring and questioning our inner stories can greatly enhance our emotions and chances for success and happiness. My journey into life coaching has followed an unconventional path. (And I’m a big fan of unconventional paths.) I received my Bachelor’s Degree in journalism, with an additional focus on Scandinavian Studies, from the University of Wisconsin-Madison in 1991. 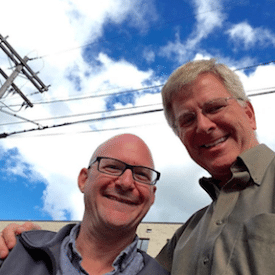 Rick Steves and me – in his über-exotic parking lot in Edmonds, Washington. After university, I worked as a newspaper reporter and radio news anchor before landing a job in 1995 with travel author and television host Rick Steves. I spent 16 years as a website editor, travel consultant, and tour guide for Rick’s company. When I wasn’t leading tours in Europe, I also taught writing and travel workshops in the Seattle area. In 2011 my wife, Kattina, was offered a job at an international school in Singapore. That’s when I left my European tour guiding career to write and teach online writing workshops full-time. Among other topics, I created online courses on the mental challenges writers face, such as writer’s block, procrastination, and distraction management. I came to realize many of those issues, particularly in the realm of negative self-talk and self-bullying, affect non-writers as well. I offered (and still offer) one-on-one writer coaching via phone and Skype. Some of my clients were bringing personal issues into our sessions. Some were struggling with feelings that came up as they wrote about emotionally painful topics. Others were going through life events that were affecting their writing and creativity. The more writers I worked with, the more I discovered that coaching people through emotional challenges came naturally to me. As a journalist and travel writer, I’ve been trained to ask effective questions and listen with empathy rather than judgment. As a tour guide, I have learned to understand and relate to a diverse range of personalities. I worried, however, that helping my writing students navigate difficult personal issues might be treading into territory I wasn’t qualified to handle. And so … I decided to get qualified. I received my Professional Life Coach Certification from the Transformation Academy in 2017 and continue to expand my knowledge of coaching techniques and specializations through a variety of resources. You can read more about the techniques I use to help people achieve their goals and attain greater happiness on my Coaching Style and Philosophy page. I was born and raised in the United States but when I was eight, my family moved to England for a year. That year sparked a lifelong passion for international travel and exploring foreign cultures. I later spent a year of high school and a year of college in Norway, taught English in Turkey, lived for four years in Singapore, and have been based in Ho Chi Minh City, Vietnam, since 2015. I’ve spent roughly one third of my life overseas. I’ve worked as a guest lecturer on cruise ships in the South Pacific and the Baltic Sea, and have led travel writing workshops in Botswana. I’m fascinated not only by foreign cultures, but also how being in a foreign place affects our emotions and outlook on life. I’ve authored two best-selling travel books, contributed to guidebooks and anthologies by Rick Steves, Lonely Planet, and Travelers’ Tales, and have written freelance articles for a variety of magazines and newspapers in North America, Asia, and Europe. I’m a travel humor columnist for En Voyage, the in-flight magazine for Taiwan-based EVA Air, and I am currently writing my third book, The Ghosts of Bui Vien Street, about the people who live and work in Saigon’s so-called “backpacker ghetto,” and the things travelers don’t understand when they pass through the neighborhood for a few days. 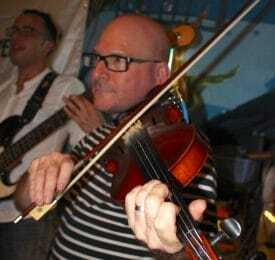 My other passions include foreign languages and music. I speak fluent Norwegian, conversant French, and I’m learning Vietnamese. I’m huge fan of Celtic folk music and recently became the fiddle player in Gwennili, a Breton (French Celtic) folk group in Saigon. I believe that life is all about stories. We are each living our own, unique, internal and external stories, and we are each characters in other people’s stories too. I’m on a mission to help people discover and live the stories that give their lives a sense of purpose, and to help them find happiness and fulfillment in the ways that are important to them.